Nothing about the packet on the bench in front of Sandy Orlowski ’08 ’10 seemed out of the ordinary. As a forensic scientist, she was used to police bringing her small, plastic-foil envelopes with cheery, whimsical labels totally at odds with the contents. This one said “Ivory Wave” and featured a relaxing beach scene complete with bare feet and palm trees. 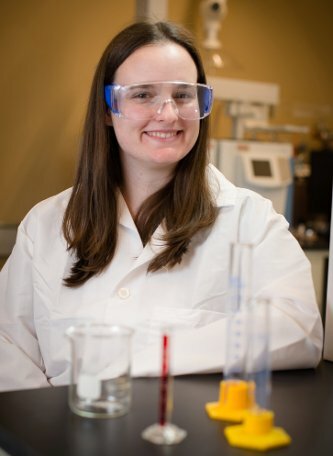 Donning gloves, safety glasses, and a surgical mask, she opened the package, weighed the contents, and reminded herself, “This is an unknown white powder.” Orlowski is a player in Michigan’s war against illegal drugs, but above all, she is a chemist. While attorneys may be trying to build a case that will sway judge and jury, her responsibility is cut and dried: identify what’s in that packet. So she began contacting crime labs throughout the Midwest. The Drug Enforcement Administration lab in Chicago got back to her right away: her white powder was naphyrone, a member of the big, bad family of designer drugs known on the street as bath salts. Four years later, Orlowski knows naphyrone and its cousins like the back of her latex-gloved hand. “They are not the kind of bath salts you buy in a department store,” she says. These chemicals are synthetic derivatives of the cathinone molecule found in khat. The flowering plant is chewed as a stimulant in the Horn of Africa and the Arabian Peninsula but is illegal in the United States. The ever-inventive manufacturers of illicit drugs had made bath salts by fooling around with the cathinone molecule: slapping on a ring structure here, a carbon chain there, maybe a fluorine or a bromine. “The idea was to circumvent the law,” Orlowski explains. At the time, most illegal drugs were defined in Michigan by their precise chemical structure. Thus, manufacturers reasoned that they could transform a controlled substance into a legal (though no less pernicious) high, simply by tinkering with that structure. The chemical hanky-panky wasn’t limited to bath salts. Also finding their way into crime labs were synthetic cannabinoids, like JWH-250, designed to mimic the pain-killing and anti-inflammatory properties of marijuana. Then there were the synthetic phenethylamines, a far-flung suite of compounds that includes MDMA, which often goes by the street name Ecstasy. Not to mention tryptamines like DMT, close cousins of the hallucinogen psilocybin. The designer drug industry was seriously on a roll. Then in 2012, the Michigan legislature put an end to some of the confusion by passing a law regulating classifications of compounds, not just the compounds themselves. “That allows us to report out the specific compound’s name instead of ‘no controlled substance detected,'” says Orlowski. Their legal status may be settled, but that doesn’t change the fact that designer drugs have made the already-perilous underworld of substance abuse even scarier. While forensic scientists can identify what’s in that packet, it’s virtually impossible for the consumer. “That’s the mystery, and the risk,” says Orlowski. “When you are buying something that doesn’t have legitimate quality control, you don’t know what you are going to get.” Case in point: in one drug-related prosecution in Houghton County, Orlowski analyzed twenty-one packets of unknown powder and plant material. Two were synthetic cathinones (mephedrone and MDPV), five were synthetic cannabinoids (JWH-250), and the rest were not controlled substances. The consequences of such confusion can be fatal. Orlowski is at ease on the witness stand, but the lab is her home. “I love analytical chemistry, and I love what I do,” she says. And she loves solving puzzles like naphyrone. Should the ever-resourceful illegal drug chefs cook up yet another designer drug, she’ll be ready.